When I've already written three blog posts about a game it's probably clear to all of you that this is going to be a pretty favourable review. The first Uncharted was a good game, not a great one but never the less one of the best experiences I'd had up to this point on my PS3. This sequel had something of a legacy to live up to for me because I'd invested a fair chunk of my existence in game one to earn the Platinum trophy. 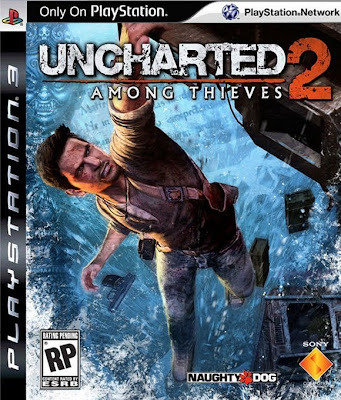 Uncharted 2 delivers and then some. Lets talk about the specifics. Graphically this is just stunning. It's the sort of game that you can put on to show of your PS3 to friends and family. The level of detail in the environments is incredible and the size of each area is more than impressive but what really amazes though is the view. There are genuine moments when you pause and just take everything in. One section sees you climbing to the top of a hotel in the middle of Kathmandu and you can literally see the whole city. I have no idea how the developers have made it all look three dimensional but the effect is mind boggling. I stayed there as long as I could just to admire the achievment. The characters are beautifully realised, how often does a game live up to its cut scenes? Rarely, but here on occasion they are superseded. Nate moves as you expect him to, stumbling over uneven ground, running, jumping and rolling spectacularly when required. So it's pretty then. But is the gameplay up to scratch? Essentially the mechanics of the first game are all still in place so it's Tomb Raider esque third person but with improvements from its predecessor. This time round you can hang from ledges and gun down the opposition and the gun fights feel more solid and weighty. The platforming sections of the game are well executed but at times you do yearn for an alternative route. 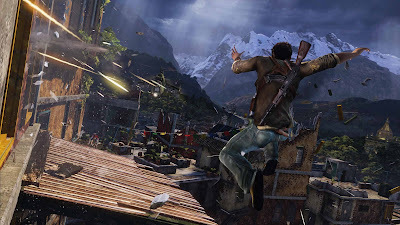 That would be my only complaint about Uncharted 2, that it all feels a bit on rails at times. There is so much to love here though, the voice acting is wonderful, by far the best I've heard in any game. Couple that with the motion capture cut scenes and you have a cast that is superbly brought to life. It is cinematic in all the ways that Metal Gear Solid, on reflection, failed to be, because so often the story is allowed to play out during the game rather than rely on cut scenes. New character Chloe in particular is a joy to work alongside and that is one of the biggest improvements on the first game. For most of the story you are not working alone you have one of several companions working alongside you. Normally this is a problem in games as the secondary support character becomes an irritation and a hindrance to progress rather than a help. This is not the case here by some margin. They play their part, find cover, and most importantly they shoot at the enemy and not in the impotent way you've been used to in other titles. There are some wonderful set pieces which I won't spoil for you here but you are never left thinking, 'that would never happen in real life,' despite how ridiculous some of it is. It's Indiana Jones in style but easily better than the last movie in that series. It's a cracking romp across various locations from Turkey, Kathmandu to the Himalayas you will keep playing just to see what could possibly happen next. The multi-player I've only dabbled in so far but it looks very promising with perks etc in the style of Call of Duty but this is worth a purchase for the single player alone. If you own a PS3 you should own this game. It might just be what it was made for. Absolutely stunning.